The tagline of Views from Eagle Peak is “Seeing things as they really are, without the illusions or delusions.” That’s something that takes wisdom, which is something that comes from time and faith. Faith in something that works. Eagle Peak is an allegorical reference to a place where the Buddha lives and practices. In one sense it’s an actual place. More generally, anywhere one practices Buddhism is Eagle Peak. A place where one can see how and why things are the way they are. Cause and effect. Today is the 40th anniversary of my commitment to practicing Buddhism. Looking for hope, a methodology and a means to achieve my goals and dreams. I needed to overcome indecision and procrastination. Almost without noticing it, I did. All a part of what Soka Gakkai International (SGI) President Daisaku Ikeda calls “human revolution.” An inner transformation of character. One that enabled me to overcome so much and achieve so much. I could go on for many pages describing the good fortune and joy this practice has brought me, but I won’t. Instead, here’s a short list. After a year in Vietnam which began ten years before I encountered Buddhism, my illusions were shattered about America’s virtues and my innocence was lost. My faith and practice couldn’t bring back the innocence but it gave me the means to make the world a better place by making myself a better person. 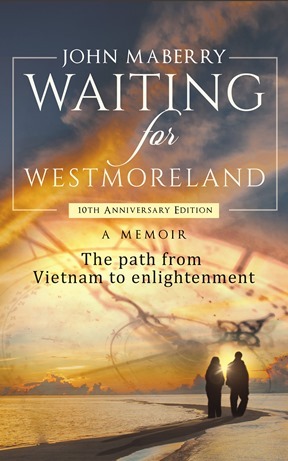 Nearly ten years ago, I recounted the experiences which led me to Buddhism and the benefits that resulted from that human revolution in a memoir, Waiting for Westmoreland. Now, I am finally on the way to writing fiction, my goal from childhood. A short story collection, The Fountain, went on sale July 10th on Amazon. We live in a dream house, high atop a hill in southwestern New Mexico. A house I designed on a computer. A far cry from the home I grew up in, foreclosed on when I was 11. My mother could not pay the mortgage after my father died four years before. She died five years later. Of the three treasures, “treasures of the heart” are the most valuable or important. These too, we have in abundance. The certainty that we can achieve anything, that we can overcome any adversity. That our happiness is absolute—not relative, like winning the lottery, a wonderful car or a wonderful home that could be destroyed by fire or flood. One doesn’t need to practice Buddhism to be successful in life—to have a happy marriage or a good job. One doesn’t need to practice Buddhism to be financially secure or able to overcome illness. But it certainly helps immeasurably. If it didn’t, if it hadn’t, I wouldn’t still be doing it 40 years later. I would be happy to share more of my own experiences with you about this practice or refer you to sources of information about it—should you be interested. But today’s post is not a paean to draw you in, it’s a commemoration of my personal anniversary. One more important note: the path to becoming a Buddha, an enlightened human being, runs through the world of the Bodhisattva. In other words, the practice of Buddhism entails practicing for others as well as oneself. It’s not a greedy, self-realizing endeavor that you keep to yourself. Oh no, it’s a practice that involves helping others find happiness, hope, courage and more through the compassion of a Bodhisattva. An essential element of the beneficial results I’ve obtained over my 40 years of practice stems from that commitment.